When it comes to tinkering with sensitive parts of the Washington Administrative Code (WAC), the Seattle Community College District (SCCD) administration just can’t get enough, and is trying to change the portion regarding public records requests. Though the official policy proposal is still in the works, it is guaranteed that it will potentially give the district administration further freedom to make it more tedious for citizens to gain access to vital records and documentation of the administration’s activities. Firstly, some context: The WAC is a set of administrative rules and regulations established at the state level which govern how lower level public agencies can operate, in this case, how the district can approach public records requests made by citizens. In addition, public records refer to any documents that pertain to the operation of a public agency, ranging from financial reports to personal email communications between administrators. Enables SCCD to charge 4 cents per page in the event that requestors want paper documents scanned and sent to them in an electronic format. This legislation would be applied to the entire SCCD, which includes Seattle Central, North Seattle, South Seattle, and the Seattle Vocational Institute community colleges. 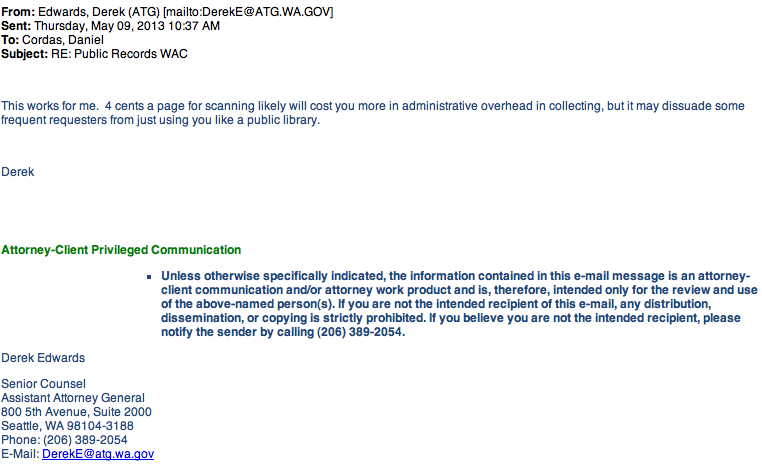 “Our WAC is outdated since it was written before the Public Records Act was created. We are updating it because it is necessary to comply with the law,” said Simperfenderfer in an email. The current WAC is gathering dust and the proposed changes are within legal boundaries. But by raising the costs for scanned electronic copies and the exemption of SCCD ‘trade secrets,’ the policy updates suspiciously appear to be an effort by the SCCD to insulate itself from the prying eyes of concerned citizens. The Public Records Act (PRA) Chapter 42.56, subsection RCW 42.56.120, states that “A reasonable charge may be imposed for providing copies of public records and for the use by any person of agency equipment –“. Fair enough. Though minuscule, the use of equipment and staff time does cost the agency financially. The PRA goes on to state that if an agency conducts proper studies on the actual cost of copying records, they are allowed to solicit that amount and not a penny more. 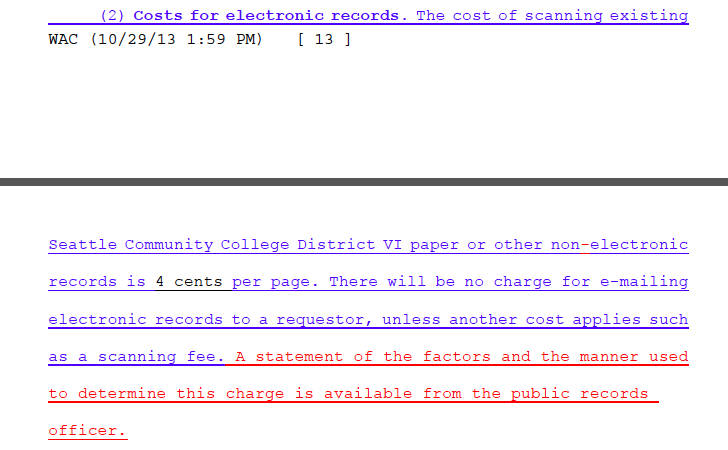 To their credit, the district did the math, and concluded that 4 cents a page would be an appropriate price for scanning documents after factoring in staff salaries for time spent scanning documents and the electrical cost of using the machinery. It all seems innocent enough with 4 cents being a relatively small amount, but communications between the gang of district admins reveal a more sinister motive than the financial figure suggests. The key words in that email are “dissuade” and “frequent requestors”. They point to the SCCD’s sly use of a legal loophole to try and make obtaining public records an expensive hassle for requestors. Daniel Cordas sent an email in response saying “That’s the hope and the dream”, further indicating a keen desire within the SCCD administration to see those ‘pesky’ inquirers solemnly walk away in defeat. “I think that [Edwards’ statement] is inconsistent with the spirit of the public records act,” said Toby Nixon, president of the Washington Coalition for Open Government (WACOG), an organization that advocates for government transparency. “To think that they have a right to jack up the price of copies as a deterrent to people exercising their right to inspect public records is just wrong,” he added. However even Simpfenderfer acknowledged that most public records requests are for email communications and documents already in electronic format, sent via email, which require no scanning or printing machinery to duplicate, contrasting with the claim that the district is being overly burdened by belligerent mortal enemies of the SCCD who are intent on burning the district to the ground by bankrupting them with the vicious unforgiving sword of the PRA. Nixon said that while there are a few scattered incidents of people using the PRA as their “bludgeon of choice” in an attempt to deal blows to public agencies, the PRA includes avenues for dealing with such situations such as spreading out responses to requests over a longer period of time and asking for deposits prior to sending out copies of records. He indicated that the underlying motive is most likely an effort to obtain broader abilities in terms of what public records requests they can deny, a trend that has been consistent amongst public agencies across the state. “What the agencies want is a very broad power to get injunction to block people that they deem to be harassers or abusers of the public records act,” said Nixon. “In general, there are wide spread attitudes amongst public agencies that public records requests are an annoyance,” he added. In addition, the exemption of “trade secrets” from viable records requests is troublesome. The term is defined as information that gives a business an economic advantage over their competitors. In the case of the SCCD, this means the various companies or ‘vendors’ that the SCCD employs to provide services. With increased privatization of services rampant throughout SCCC and public universities, the exemption of this key broad category of information allows for the roping off of potentially vital information. Scenarios such as the notoriously unreliable Higher One student financial aid disbursement company (which contracts with SCCC) withholding the specific amount of money they have skimmed off of student accounts via vague fees and fines through the ‘trade secrets’ exemption come to mind. Why does any of this matter? Because citizen access to records are one of the few ways that ordinary folks can keep tabs on what these public institutions are up to. Without the PRA, information on the elusive behind-the-scenes doings of public agencies such as the SCCD would be otherwise unattainable. Laurel Holliday, a former English instructor at SCCC, retired psychology instructor, and government transparency activist, cited her use of the PRA to scan and obtain copies of documents which showed how SCCD’s claims on how much the Occupy Seattle encampment on the SCCC campus was costing them financially (in extra security & maintenance) were significantly lower than the admins’ allegations. Public records requests were also used by community members to learn about the SCCD’s efforts to muzzle campus demonstrations and free speech, alarming information which started an uproar and has since resulted in the District giving up their atrocious efforts to keep people from engaging in acts of civil disobedience. 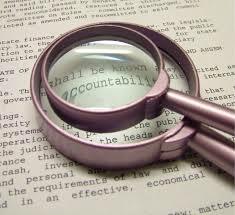 “Through careful attention to how the District is proposing to respond to public records request we can help ensure transparency and hold the District accountable for those things they’d rather we not know,” said Holliday in an email. While the final draft of the WAC updates have yet to appear in the Washington State Register, a public hearing on these WAC changes is planned to take place on December 5th, after which the administration hopes to have it through the bureaucratic implementation process and in effect by early spring. Citizens should have sway over their public servants, not the other way around as the SCCD administration views it. A copy of the most recent WAC changes can be found here and a link to guidelines on conducting public records requests can be found at the SCCD website. A lively story slamming Seattle Community College District’s transparency avoidance tactics.